Real Madrid manager Jose Mourinho is being investigated by police after allegedly kicking a fan up the backside hours after star player Cristiano Ronaldo called on supporters to stop abusing the self acclaimed special one. The Portuguese was reportedly approached for a photograph when out shopping on Thursday but responded by lashing out at the fan while his bodyguard allegedly threw the man's mobile phone to the ground. 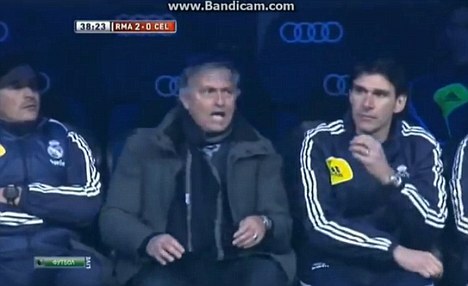 Mourinho has denied the claims which come as he struggles at the helm of the Spanish giants. Madrid are several points behind bitter rivals Barcelona in La Liga and face Manchester United in the Champions League next month. And the Bernabeau crowd have turned on Mourinho in recent weeks, particularly after he dropped Iker Cassilas. But Ronaldo has pleaded with the supporters to back the boss. 'The boss is going to stay, we still have a lot we can win this year. He is in charge and he takes the decisions, the fans and the players should help him. Meanwhile, Mourinho watched his side struggle away from home once again as Real Madrid were held to a 0-0 draw at Osasuna. If Barcelona triumph over Malaga on Sunday, Real will be 19 points behind the league leaders. Real, who were without leading goalscorer Cristiano Ronaldo, were unable to penetrate a dogged Osasuna side and their chances of retaining the La Liga title look increasingly bleak after some suspect away showings. Substitute Kaka was sent off midway through the second half after standing in front of a freekick as it was about to be taken. The Brazilian picked up a second yellow and Real's chances of sneaking a win effectively vanished after his dismissal.